The painted panel above was done on one of the scraps of watercolour paper I like to have lying around already covered with drops of masking fluid. I try to never prepare just one but rather flick the fluid over several pieces of both watercolour paper and white cardstock. That way they will be dry and ready to use whenever I get the chance. 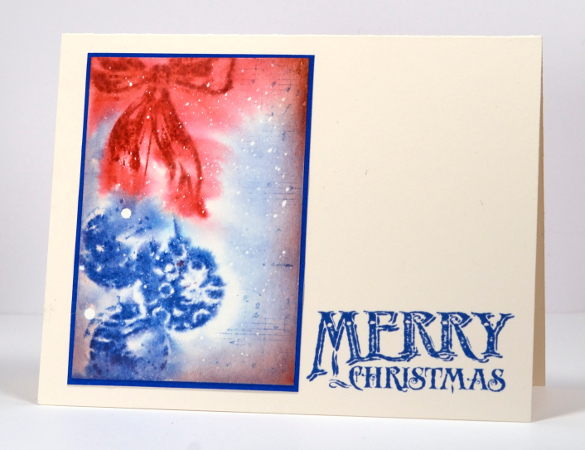 I painted water over the whole panel then inked the stamp from the “Ornately” set with blue and red ink. The ink blurred and bled all over the place immediately but after it had had a chance to dry off just a little I reinked and stamped again in the same place to get the soft edged image. I added the music background and some sponging around the edges. When all was dry I gently rubbed off the masking fluid , matted with blue and added a sentiment to match. No baubles up at my place yet, how about you? I am without voice!!! Je suis sans voix! I try to do it but never do like you do… because watercolor paper? I don’t know but mines are so so… and I would like so much to do like you!!! Lovely look Heather!!! Well Done!!! !